Stetson Blaylock's victory at Winyah Bay was his first at the tour level in 10 years. 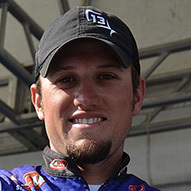 When Stetson Blaylock won the Lake Norman FLW Tour as a 22-year-old in 2009, he had no inkling that a decade would pass before he'd achieve victory at the sport's top level again. 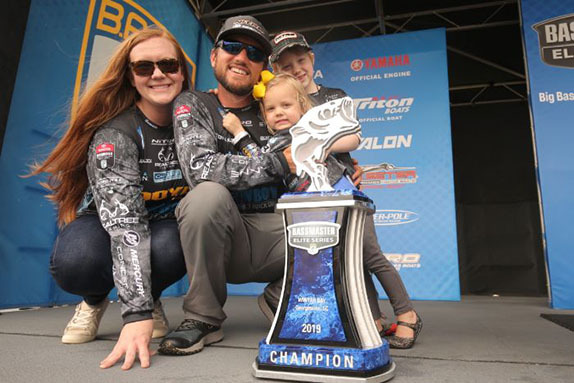 "I did not think it would take this long," he said a day after claiming the trophy and the six-figure paycheck at the Winyah Bay Bassmaster Elite Series. "I've had quite a few 2nd-place finishes since then, but the bottom line is that it's just hard to win. "You just have to believe that if you keep putting yourself in that position and making top-10s and top-5s, eventually it's going to happen." 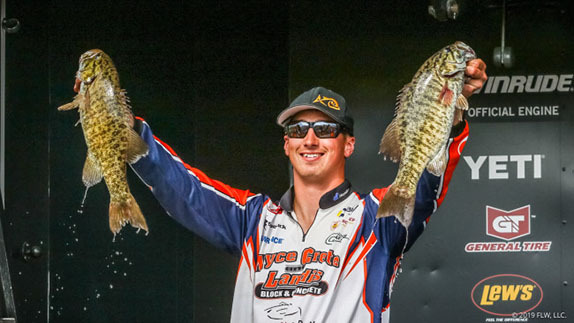 There was a prevailing opinion that the tournament would be won from the Cooper River, which required a grueling run in excess of 90 minutes along the Intracoastal Waterway from the launch in Georgetown, S.C. That's where Britt Myers caught his winning fish the last time the circuit visited the sprawling venue in 2016, and at least half of the 75-angler field ventured that way last week with the belief that that the Cooper harbored the largest, most numerous and easiest-to-catch bass of the five rivers that were in play. That assessment may be true, but Blaylock proved that the long journey through Charleston Harbor, which cut fishing time about in half for competitors who undertook it, wasn't the only possible route to victory. He compiled the vast majority of his weight from a small, man-created backwater off the Waccamaw River. The area he fished is known as "The Fingers." It was also utilized by fellow top-10 finishers Jason Williamson, Koby Kreiger and Clent Davis. "You come off the river into a straight canal that's 200 to 300 yards long, and every 50 yards or so there's a small canal to the right and one to the left � like four canals on each side," he described. "When you get to the very back, it hooks to the left and there's another 50-yard canal. At the end of that it opens up into a 20- to 30-acre sand pit, and at the back of the pit there was 20 to 25 feet of water in there. "I went in there in practice and I only fished about half of it because there were two other boats in there. I got a few bites and I knew it had the potential for me to catch enough to make the top 35. I figured I could fish it for two days and (surviving the first cut and earning a $10,000 paycheck) would be about as good as it would get." 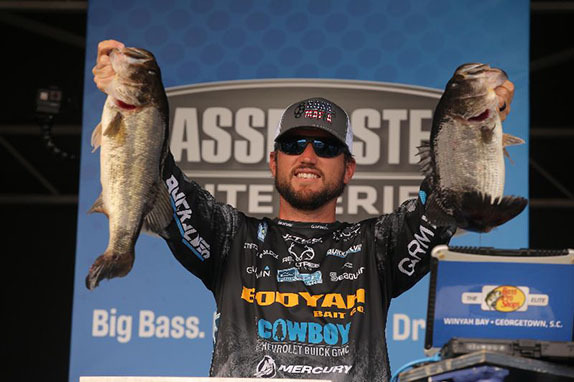 Blaylock started the first competition day with no inkling that he could come anywhere close to replicating � much less improving upon � his 2nd-place finish from Lake Hartwell the previous week. He caught an 11-06 stringer that put him in 11th place. "I was extremely thrilled with that," he said. "When I left my area I only had four fish and when I was running back to take-off, I passed a canal where I'd caught one fish in practice. I had enough time for 10 casts, and I pulled in there and on my 6th cast I caught a 12-incher. 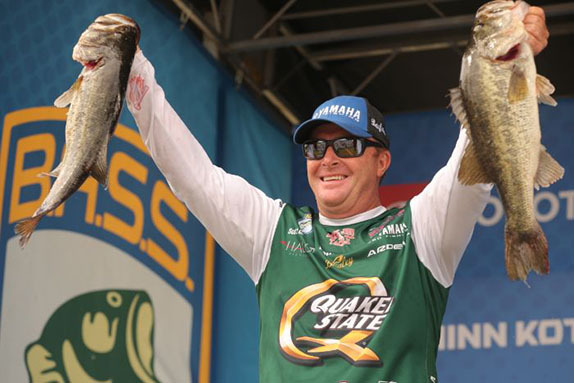 Without that fish, I don't win the tournament (his final margin over runner-up Scott Canterbury was 9 ounces)." He caught that fish on a homemade jig, but the rest had been enticed by a wacky-rigged YUM Dinger, which was his primary bait for the derby. His boat was the 66th to leave the launch on day 2 and he was pleasantly surprised that nobody else was fishing the sand pit when he arrived. He caught 12 1/2 pounds (four fish on a Dinger and one on a topwater plug) by 10:30, assuring he'd make the cut, and went on an unfruitful search for fish that hadn't been pounded on for day 3. 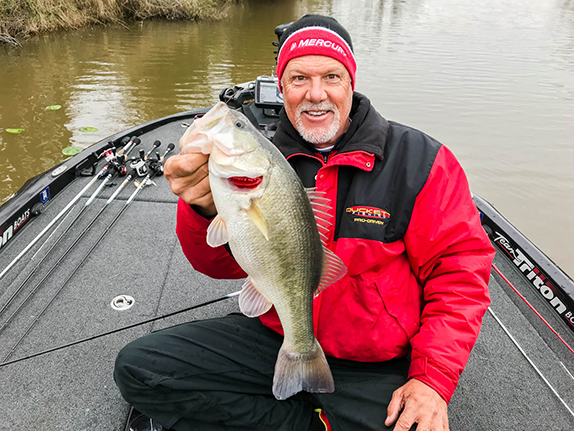 Blaylock moved into the lead with a giant bag on day 3. Not having anything else to turn to, he returned to the pit on day 3 and managed to load up again, leaving with his best haul yet that included a 4 1/2-pounder. He decided to troll through one of the small canals on his way out and spied a 5-pound female on a bed with a much smaller male. He caught the male, which drove the female from the bed. "I went back after a little while, after the tide had switched, and when the water came back she got aggressive and I got her to bite," he said. The entire ordeal played out over a 30- to 45-minute time span. "I had plenty of time and I knew that fish was a huge difference-maker. I would've spent the rest of the day on her." That one pushed his stringer to 17-15 � tops for the tournament � and into 1st place with one day remaining. He had severe doubts about his potential for the final round, though. "Not only did I catch over 17 pounds, but Davis had two big ones, Kreiger had 15 pounds and Williamson had a decent bag. Four of the top 10 had caught several fish, if not all of them, from that one particular area. It was like, 'Yay, I'm in 1st,' but I knew there probably wasn't enough fish to go around for another day." He was right about that, as the quartet all saw their weights plummet on the final day. Blaylock said things didn't feel the same as the previous three days when he got to the pit on day 4. "It felt like I was out of fish," he said. "I did get some little bites and caught a couple keepers, and that let me know there still were a few bass in the area. I took my time and picked it apart and caught another keeper, then I lost a nice one, probably a 2 1/2-pounder. "I was afraid I wasn't going to be able to make up for that fish and things started to go downhill performance-wise. I wasn't making good casts and I was hanging up a lot and it felt like everything was unraveling in front of me." A couple more keepers gave him a limit of squeakers and he pulled out at 11:30 to try the small canals. In the same channel where he'd caught the 5-pound bedded fish the previous day, he pulled a 21/2-pounder from a dock that he'd fished three times during the event with no success. He went about 2 hours before catching his final fish � a 1 3/4-pounder. When he opened his livewell to make the cull, his smallest fish, weighing well under a pound, appeared dead. When he laid it on his deck, it gulped twice and he took off the cull tag and placed it in the water. To his amazement, it swam away. Having no idea that the rest of the top 6 had also struggled, he figured he was headed for a 5th- or 6th-place finish. But he'd made back-to-back top-10s and rationalized that he had nothing to complain about. He found out when he returned to the launch that seven of the top 10 had bags similar to his or smaller. He also learned that Scott Canterbury, who'd started the day in 8th place, had come back from the Cooper with a huge haul (just over 16 pounds). "After Canterbury weighed in, I did the math in my head and I knew I needed about 9 pounds, and I didn't think I had it. When my fish went on the scale and the first number was a 9, I didn't even read the ounces. I knew it was over. "After having such a terrible final performance but still coming out with a limit that was enough to win, it's hard to really describe the feeling." > Soft stickbait gear � 6'10" medium-light 13 Fishing Envy Black rod, unnamed spinning reel, 20-pound Seaguar Smackdown braid (main line), 10-pound Seaguar InvizX fluorocarbon (7' leader), 1/0 Gamakatsu G-Finesse Drop Shot hook, 5" YUM Dinger (green-pumpkin) with 1/32-ounce nail weight in head. > Sight-fishing gear: 7'3" heavy-action 13 Fishing Envy Black Series rod, prototype 13 Fishing casting reel (8.1:1 ratio), 20-pound Seaguar InvizX fluorocarbon, 7/16-ounce tungsten weight, 3/0 Gamakatsu G-Finesse hook, YUM Christie Craw (white). > Topwater gear: 6'7" medium-action 13 Fishing Envy Black rod, 13 Fishing Concept Z casting reel (8.1:1 ratio), 20-pound Seaguar Rippin' Premium monofilament line, Rebel Pop-R P-70 (Tennessee shad). Much of the tackle referenced above is available at the BassFan Store. To browse the selection, click here..
Larry Nixon � "I fished with him when I was 17 and he taught me a lot. He's always been nice to me, and even called me after my first win and congratulated me. That's saying a lot. And he's one of the best that ever was, and still is that good." Dad and uncle � "My uncle got me into fishing, and my dad's always been there to make sure I get what I need. He's definitely a hero." Likes to go to restaurants and try new food. Also likes going to the movies.